New season… New team… You need to flex on those young bloods with the new drip on your feet. 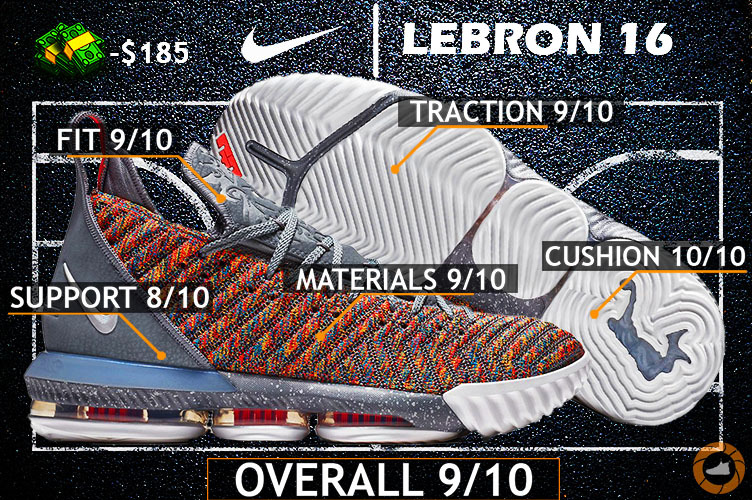 The Nike LeBron 16 Performance Review is freaking here. Let’s get it! BattleKnit is back but within the redesigned construction. First introduced in last year’s model, the BattleKnit was trying to make a statement as the incredibly form-fitting upper with great support & containment properties, obviously, to keep up with LBJ’s force. That stuff did live up to expectations, well, sort of. I’ve never busted my feet out of the footbed which means it did what was claimed. But I always felt like the upper was still comfort & sock-like fit first & everything else being sort of as a background – leaving me with some extra stretch within the lateral side to deal with when force is applied. So again, it was enough to keep me on that midsole, but not enough to keep me feel mentally secure – if that makes sense to you. Luckily, Nike was able to fix all of those issues with the introduction of the BattleKnit 2.0 on the LBJ 16. It’s now a two-way upper – knit & nylon is working in tandem to make BattleKnit worth its name. Yep, this combo is built like a tank from the outside but soft & form-fitting as a sock from the inside. No gimmicks this time around. So the main body is the nylon sleeve which is responsible for making the whole set-up flexible & second-skin like. While that beefed up knit layer on top is here for you to keep everything together as one unit without compromising breathability & comfort. Oh, and there’re some hints of synthetic leather located on the tongue and heel areas. It’s definitely not as premium as back then, but, man, it’s a perfect piece of real estate to put those sick logos, right? 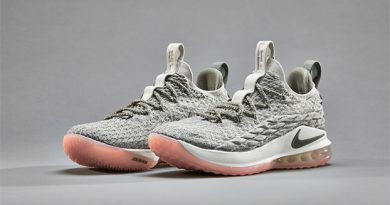 The LeBron 15 passes the torch on to his successor the LeBron 16 as the most cushioned ball sneaker you can grab right now. The 16’s midsole remains powered with the same Zoom Air & Max Air madness. So tech wise nothing has changed. BUT… Nike did tweak the caging around the tooling – made it a tad bit higher & stiffer on the sides. Which has completely removed that sink motion the 15 had when applying force, without actually touching or changing the good stuff. That being said, you still do receive the same crazy amount of impact protection/compression, yet, bounciness and overall responsiveness of the set-up are much-improved on the 16. If I have to compare it with the latest stuff out there – it would be the AJ 33 – but ten times crazier. The LeBron signature line was never been known for its killer traction. Always been somewhere in the middle judging the overall performance. Can say the same about his rest of the team line-ups. 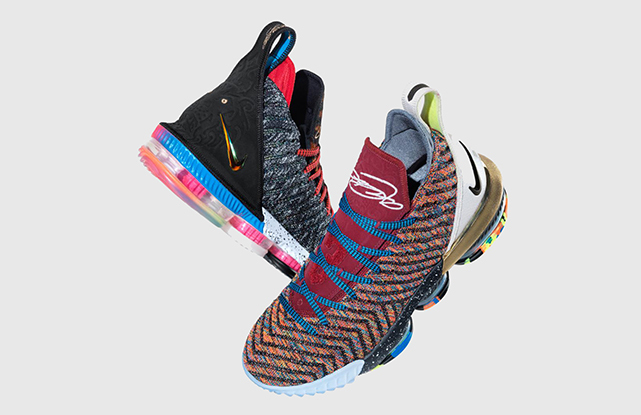 But then we got the LeBron 16… These bad boys are way out of this league – in a freaking good way, obviously. First time in a while we’re witnessing a gradual herringbone pattern on the LBJ’s main sneaker. 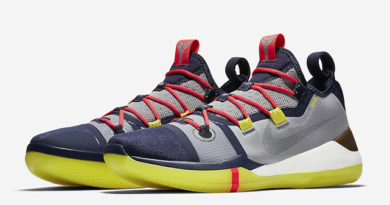 Starting off from the heel, the pattern sort of mimics the LBJ’s silhouette and then gradually transforms into a more traditional/aggressive version of herringbone as you move towards the forefoot. When it comes to hard cuts, quick direction changes or stop-and-pop type of situations, forefoot acts as a focal point to make these moves working, that’s why the traction in the forefoot is way more aggressive on the 16. Though, I couldn’t feel the heel slacking behind any bit. The whole tooling did its thing in a beastly fashion. No matter what I threw at them – dusty courts, nasty courts, even outdoor courts – these things just go. Whipping? Forget about that as well. The fit might through you off a tad bit since they do run pretty stiff at first. Just don’t panic or start searching for the receipt. Give them an hour or so of good ball session – they will adapt to your foot – I promise you. After that quick personalization process, they do start to fit like a second-skin if the right size. Now talking about sizing, the 16 does run somewhere in that sweet spot. Not too narrow & not too wide. Y’all wide footers would love that, wouldn’t you? Back to the point, I do recommend going true to size for everyone out here, unless you have one of those hockey sticks like feet (*cough* KD *cough*). In that case, you want to go with something from the KD line. Again, I loved how the upper, after giving it some time, was as form-fitting as it was contained. You don’t get that imbalance within the upper anymore as you would do from the 15, them more emphasizing comfort rather than balancing out all the aspects. With the 16 – you’re getting that all inclusive package. Now, if you still do run into some type of slippage problems, no matter what type it is, try playing around with the second row of lace feeds you got. That should do the trick. Also, the tongue has a built-in gusset for an easy access to the shoe as well as for feet with a higher bridge. The LeBron 16 isn’t the most supportive sneaker out there in the market, but it doesn’t need to. Nike actually implemented a few major upgrades to the bottom, which made the successor head and shoulders above than its precedent. All the instability issues have been fixed by stretching out the midsole caging & adding up outriggers on every single articulated midsole unit. And the best part is that they did that without toning down the cushioning, actually, they made it even crazier. So, again, lateral coverage & midsole’s overall stability is much improved. Didn’t come across heel slippage or other problems related to containment – all the areas seemed to be solid all throughout. Remember the times when LeBrons were not for everyone? Yeah… Good old days… It’s all different now tho. 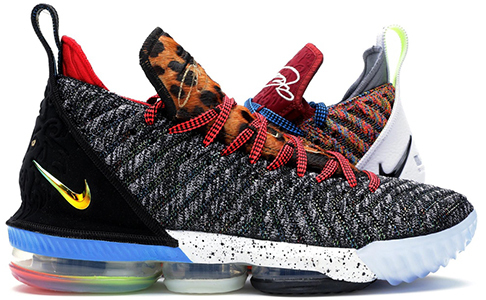 The LeBron 15 being the very first pioneer that introduced the line into the modern “shoe game” – the 16 continues pushing the same direction with much improved performance & freshened up silhouette – all in one well-balanced package. If the best in the game cushion set-up along with killer traction that puts the majority of other signature sneakers to sleep & one of the best iterations of knit sounds good to you – these might be your next pick-up. Hope you enjoyed my Performance Review on the NIKE LEBRON 16. Will you be picking them up? Let me know! 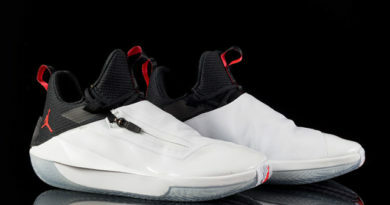 These or the harden vol 3? Rather high of the ground/springy/responsive/impact protection packed ride (LeBron 16) VS Low to the ground/fast/responsive ride with a minimal amount of impact protection. Who you got? Aa on ADIDAS DAME 4 REVIEW – Another Performance MONSTER? !